Our Agent business is to support athletes regarding the negotiation with clubs and related persons for their players’ contracts, to realize their visions with discussing with each athletes so many times because of arranging the best conditions for the more improvement of their skills and values. 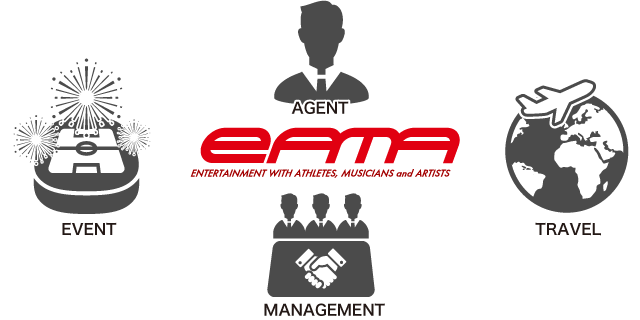 So far, eAMA has done the successful contracts for over 100 international and domestic football players and over 15 international coaches, for national athletes such as Pierre Littbarski, Dragan Stojkovic, Patrick Mboma, Seigo Narazaki, Atsuhiro Miura, Joshua Kennedy and more, for famous coaches such as Arsene Venger, Pim Verbeek, Ivan Hasek and more. As one of our management business, our duties for athletes are both to make the athletes’ value increase by the measurements such as media appearance, commercial contracts, endorsement contracts, rights business to use the athletes’ name and image and to support their life and to provide the best conditions for concentrating on their sports. Moreover, we also have been doing the business of football academy and sports consulting with utilizing our domestic and international networks which are built up by our agent business. We have been trying to find the best solutions for our customers who have problems by using our many networks and experiences, communicating with them closely. Our event promotion business is to provide the total services of planning and conducting event promotions and supporting to find the sponsors. We have experienced to plan and conduct many sports events such as football, baseball, tennis, basketball, volley ball, golf and more. We can provide ideal and various event promotions to customers to meet customers’ needs by providing additional value such as guest appearance by athletes. We have done the sports tourism mixing the general travel and the sports factor. Our travel business covers many services such as not only the arrangement of traffic, hospitality, and all related services but also match making, watching games, and participation of sports events so customers does not need to arrange something by themselves. We can provide the best travel plans to professional sports teams, athletes, and of course, all customers who are not related to sports with fitting to any requests by all customers.